The Sukhoi-30 MKI: India's Two-Front War Ace? The Sukhoi-30 MKI could be the Indian Air Force’s ace up its sleeve as a “swing force” fighter in a two-front war. A report in the Russia and India Report takes a fascinating look at the role of the twin-fin Sukhoi-30 MKI air superiority fighters in the Indian Air Force’s (IAF) combat strategy. The Su-30 MKI is an eminently versatile fighter that is capable of meeting the IAF’s evolving needs, particularly in the context of a nightmare scenario involving a two-front war with Pakistan and China. I recommend Flashpoints readers check out the whole report for a fairly comprehensive description of the Su-30 MKI’s place in India’s air power strategy going forward. The Su-30 is a technological transition away from the dated and retired MiG-21 the IAF relied on for so long, and its speed, 1800 km range, maneuverability, and firepower make it absolutely pivotal in ensuring the IAF’s capability to fight a two-front war. The report cites the IAF’s April 2013 exercises – its largest ever – which involved “as many as 400 combat aircraft plus 200 transport planes and helicopters,” and tested the IAF’s readiness for a two-front war against China and Pakistan. According to the Times of India, a two front war with Pakistan and China is somewhat of a nightmare scenario for Indian military planners – neither foe’s conventional military capabilities are anything to scoff at. Estimates suggest that China could mobilize 21 fighter squadrons against India from its airbases in Tibet, and Pakistan could deploy “21 to 25 fighter squadrons” against India. 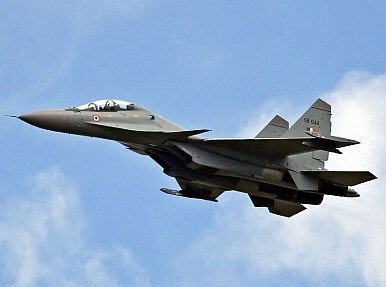 The Su-30 MKI is an “air dominance fighter.” Its large range and capacity for being refueled mid-flight make it the perfect “swing” fighter in a split two-front war that could theoretically take place simultaneously on India’s eastern and western frontiers, according to the Russia and India Report. There is another ominous angle. India’s Strategic Forces Command (SFC) has asked for 40 nuclear capable strike aircraft to be used conjointly with land-based and submarine launched ballistic missiles. Although it’s not clear whether the IAF or the SFC will operate this mini air force, what is clear is that exactly 40 Su-30 MKIs have been converted to carry the BrahMos. That’s some coincidence. According to Defense Industry Daily, Russian BrahMos Aerospace Executive Director Alexander Maksichev expects the first test-launch of the BrahMos air-launched variant from a Su-30 MKI to take place sometime this year. A report from July 2013 by the Russia and India Report states that the “air-based BrahMos missile will be different from the other versions because the very platform of the Su-30MKI works on the supersonic speed so it’s no longer necessary to accelerate the missile to the same speed.” The BrahMos variant will undergo significant changes to its chassis and nose cone to reduce weight and improve stability for the dramatically different launch scenario. The Su-30 MKI alone is, of course, quite limited in preparing India for a two-front conventional war. The effort necessitates a joint effort by the Indian Army and the Air Force. The April 2013 exercises demonstrated the importance of the MiG-29, attack helicopters, mid-air refuellers, drones, and surface-to-air missiles in establishing a robust defensive line for India against a conventional assault by Pakistan and China. Currently, a quantitative disparity exists between Indian and Chinese Su-30 fleets: China possess 400 total to India’s 272. The arrival of the fifth-generation T-50 PAK FA fighters could remedy this disparity. The report also suggests that the pending purchase of French Rafale fighters could help.